Sleight of Hand has a Magician theme. Their wines are delicious and have magician themed names! The tasting room has is brightly decorated in a modern theme, and they have a ton of music posters (many are autographed) and magician posters on the walls. They also have records – over 2,000 of them – they always have something playing on the record player! The Tasting Menu – delicious wines! I brought home their Magician’s Assistant Cabernet Franc Rosé and their Conjurer Red Blend. That isn’t to say I didn’t love all their other wines, because I did, but they are a bit above my price point, starting at $45 for their varietal reds. I did get a tank top though – which I love! Lelani found a Prince Purple Rain themed tank top there too! Lelani took this photo, not realizing I was photo bombing her! After Sleight of Hand, it was time to get on the road and start working our way home. We stopped in Yakima for Miner’s Burgers – Home of the Big Miner Burger – these burgers are huge! Trust me, if you go, split the fries. One order of fries is probably enough for four people if you plan on having a burger to yourself! Especially if you have a milkshake, and trust me on this too, you should have a milkshake! Miner’s has been a Yakima institution since 1948. We left stuffed, and happy. Our next stops were the Fruit and Antique stand in Selah, just outside of Yakima, and the Thorp Fruit and Antique stand. I love going there! We all spend some time poking around and checking out the fruit, gourmet foodie items and antiques. The last day of our February Walla Walla trip was reserved for history! The Whitman Mission National Historic Site that is – and a stamp in my National Parks Passport! Being a life-long Washington resident, I learned about the Whitmans in school, and wrote a book report on Narcissa Whitman, but I haven’t read or studied anything about them as an adult. So it was time to update my knowledge on this piece of history from my neck of the woods. Marcus Whitman was born in western New York State in 1802, and decided early on that he wanted to become a minister. However, his family was not supportive of his goal; it required seven years of schooling to become a minister. So he became a doctor instead – that only took 16 weeks! He never did forget his dream of becoming a minister and later did enter studies to become a minister, but was not able to finish due to an illness. He eventually decided to become a missionary; it took him awhile to be accepted because of the same illness that ended his ministerial studies. Narcissa Prentiss was born in Prattsburg, New York in 1808, about 25 miles from Marcus Whitman. She also had dreams of missionary work, but could not become a missionary as an unmarried woman. The record isn’t clear on how the two met, or whether it was a marriage of convenience for them to pursue their missionary careers, but they married on February 18, 1836. They left for the Oregon Territory the next day – what a honeymoon! The site is located just outside of Walla Walla, near the Walla Walla River, in what was Cayuse territory – the Cayuse call it Waiilatpu. In 1836 Marcus and Narcissa Whitman and Henry and Eliza Spalding headed west with fur traders along what would become the Oregon Trail to set up two missions in Oregon Territory – Narcissa and Eliza were the first white women to travel overland across the United States. 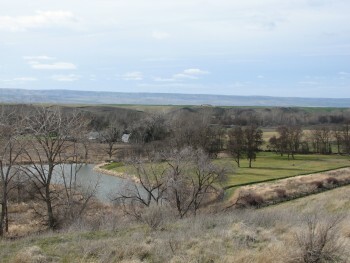 The Spaldings set up their mission at Lapwai, near present-day Lewiston, Idaho, while Marcus and Narcissa continued to Waiilatpu. They set up their mission and set about trying to educate and convert the Cayuse Indians to Christianity. Although their intentions were generally good, the Whitmans saw the Indians as inferior and I have no doubt that greatly influenced their attempts to establish a good relationship. Evidence exists that Dr. Whitman was a bit rigid in his opinions of how the Cayuse should be living – he was a bit of a ‘my way or the highway’ type of guy. Dr. Whitman did make an attempt to learn the Cayuse language and administer to the sick or injured members of the tribe. Narcissa set up a school and taught both Cayuse and children who were traveling through. Narcissa had become pregnant on the trip to Waiilatpu, but unfortunately her daughter Alice Clarissa drowned in the Walla Walla River at the age of two. Alice was the Whitmans only biological child, although they did adopt seven children whose parents died on the trail west. Sadly, those kids would be orphaned again in a few years. At first, things seemed to be going ok, but over time, many of the Cayuse began dying of diseases such as smallpox, to which they had no natural immunity. Straining tensions further was the fact that more and more white people were rolling west in their wagons and setting up shop in the territory – often stopping at the Whitman Mission for days or weeks to rest for the last bit of their journey. The Cayuse, understandably, were starting to get nervous about the larger numbers of people who were coming and claiming land. In 1847, the Cayuse began dying in large numbers of a measles epidemic that was quickly spreading among their people. Dr. Whitman tried to help the sick, but the Cayuse were largely unable to fight the disease. They noticed that white people generally lived through the disease while the Indians died, and rumors began spreading that Dr. Whitman was intentionally killing the Cayuse in order to get their land and horses. Apparently Dr. Whitman was aware of the significant decline in the relationship and was warned that his life could be in danger if he stayed, but decided not to leave. On November 29, 1847, several Cayuse raided the mission and killed Marcus and Narcissa and 11 other men and boys. Over 60 people, including several women and children, were held hostage for a month until representatives from the Hudson Bay Company could negotiate a ransom for their release. There were 19 of these people who directly witnessed the raid and were able to provide significant details about what happened. They provided a great deal of information that is useful to historians today. At the mission there was a mission house, a grist mill, a blacksmith shop and fields where crops were grown. All of these buildings are outlined for visitors with blocks, but the originals are long gone and the Park Service has not created replicas. I like it better that way – I find I enjoy a site more if it hasn’t been altered. 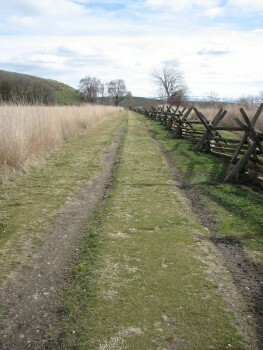 You can also see a section of the Oregon Trail, and the wagon ruts are still clearly visible – no grass grows there. It is pretty humbling to imagine walking most of the way across the United States, and to know you will never see family or friends again. Marcus and Narcissa and the others killed that day are buried in a mass grave – you can visit the site up the hill a little ways from the mission site. Later a memorial monument was placed at the stop of the hill – you can walk up to the top and get a good workout – so of course we did! There is also a visitor’s center with a small museum and a theater with a twenty minute video about the Whitmans and the Mission. The Visitor’s Center did a good job of simply telling the story as it is. They didn’t try to treat the Whitmans as martyrs, and didn’t try to villainize them either; the exhibits and the film pointed out that the Whitman’s had shortcomings and certainly contributed to the decline of the relationship with the Cayuse that ultimately cost them their lives. 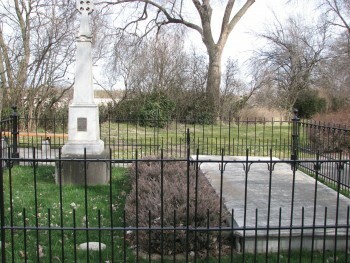 The Whitman Mission was well worth the visit – it is a very peaceful site today. There were probably a half dozen other people there during our visit. I enjoyed refreshing my memory on this couple who were integral in the history of the Oregon Trail. While wandering around downtown Walla Walla trying to decide where to visit next, we found Tero Estates on the first floor of the Marcus Whitman hotel. Tero was one of the recommendations that we received from Va Piano, so we were confident that we would find some good wines there. Tero Estates’ vineyard is Windrow Vineyard, which is Walla Walla’s oldest commercially planted vineyard; it was planted in 1981. From 1983 to 2000 Windrow Vineyards grapes were used by Leonetti Cellars. The vineyards was purchased by the current owners in 2007, and they have been making wine since. They also sell grapes to Seven Hills Winery, Walla Walla Vintners, Waters and Glen Corrie. In 2010, they hired Ashley Trout as consulting winemaker, who was making Flying Trout wines. Flying Trout wines is Ashley Trout’s personal venture; she travels half the year to Mendoza, Argentina and makes wine there. She specializes in Torrontés and Malbec under the Flying Trout label. We began our tasting with the Flying Trout Torrontés. I hadn’t heard of Torrontés before, and upon looking it up, discovered that is a white Argentine wine grape variety, producing fresh, aromatic wines with moderate acidity, smooth texture and mouthfeel as well as distinctive peach and apricot aromas on the nose (thanks Wikipedia!). Sounds fantastic! The Flying Trout 2011 Torrontés is a crisp white with flavors of honey and pineapple, and a hint of floral on the nose. I really liked it. Next we tasted the Windrow Field Blend, a Bordeaux blend of Cabernet Sauvignon, Malbec, Cabernet Franc and Merlot; instead of being barrel aged, it was cask aged. I was not a fan of this one though. We quickly moved on to the Windrow Cabernet Franc, which was smoky and spicy with flavors of stewed plums. It was a big, bold masculine wine. The 2010 Flying Trout Malbec was its feminine counterpart – a lovely Malbec made with fruit from the Gamache Vineyard. We finished off our tasting with the 2009 Tero Estates Petite Verdot, a solid wine with a big balanced flavor. Our server was friendly and provided a lot of information about the wines – she made the tasting a very pleasurable experience. And the icing on the cake – was really icing on the cake! REALLY! They had chocolate cupcakes with chocolate frosting! They had been delivered by a friend of our server and they were delicious. All in all a fabulous visit!